• 190 Stolen Bases And Counting: Petal-to-the-metal system has produced incredible results at South Mountain C.C. (AZ). 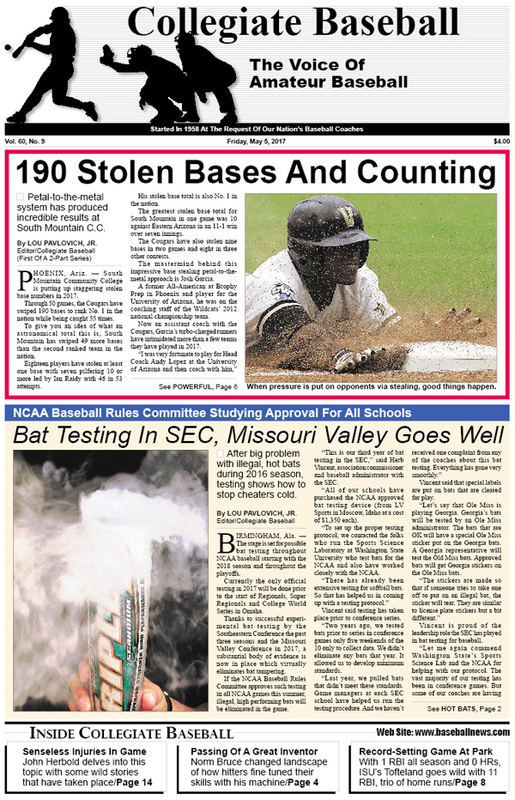 • Bat Testing Going Smoothly in SEC, Missouri Valley: After big problem with illegal, hot bats during 2016 season across game, simple testing shows how to stop cheaters cold. • Brian Cain: Power of self-talk can be huge. • Editorial: NCAA bat testing must approved for 2018, and here are the reasons why. • Lou Pavlovich: Norm Bruce, who recently passed away, helped millions of hitters. • Tom Kovic: Investigate non-athletic scholarship schools. • New Skipper At Wareham: Don Sneddon, winningest coach in California community college baseball history, will take the helm. • Ruleball With Rich Marazzi: Rule situations mandated by real, imaginary lines. • Collegiate Baseball’s NCAA Division I Poll Presented By Big League Chew: Oregon St. still on top with 32-3 record and pitching staff that features 1.88 ERA, No. 1 in the USA. • Collegiate Baseball’s National Players of The Week: Indiana State’s Dane Tofteland has amazing game with 3 home runs and 11 RBI as he is 4-for-5 against Northern Illinois. Two of his home rune runs were grand slams. Coming into the game, he had 1 RBI on the season and no home runs in limited action. • NCAA Division I Notes: Kentucky registers rarest of triple plays (7-2-6) during a game against Louisville, Mississippi State’s Brent Rooker goes nuts with 6 home runs and13 RBI over 5 games, RHP Tyler Norris of Bethune-Cookman fires a no-hitter, plus much more. • NCAA Div. 2 Notes: Valdosta St. roars to life with 11 seventh inning hits, plus much more. • Charlie Greene: Finding great players requires special scouting skills for success. • Collegiate Baseball’s National High School Top 30: Shawnee High School (OK) rolls along at No. 1 with perfect 31-0 mark, plus notes on the rest of the top 30 teams in the USA. • High School Notes: Bellarmine, Basic, Bishop Amat capture prestigious tournament titles, Brophy Prep (Phoenix, AZ) Head Coach Tom Succow plans to retire after 2017 season with over 700 wins, plus much more. • NCAA Division 3 Notes: Suffolk’s Brady Chant sets season, career triples mark, Cole Chang of Macalester College makes history with no-hitter, Trey Mears of Wesley belts 4 home runs, plus more. • Junior College Notes: Western Oklahoma State’s Angel Reyes fires no-hitter, Cumberland (NJ) wins 25 straight games, plus much more. • John Herbold: Accidents are always waiting to happen if you let them in baseball. Don’t allow senseless injuries to take place. • NAIA Notes: Lewis-Clark St. names baseball stadium in honor of legendary Head Coach Ed Cheff who guided Warriors to 16 NAIA titles, plus more. To purchase the May 5, 2017 edition of Collegiate Baseball or subscribe, CLICK HERE.